Treatment Options for Heel Pain Pain, numbness, and burning with the first steps in the morning are common symptoms of plantar fasciitis. Learn how to eliminate your heel pain. Far too many Americans are quick to dismiss foot issues—like heel pain—as being something normal or “not a big deal.” When it comes to your feet, we’re talking about valuable structures essential for providing stability and enabling you to move around – if they’re hurting, you need to do something about it! The good news is Richardson Podiatry Center makes it easy for you to know what to do – simply come in and see us! Dr. Gene Reister will accurately diagnose the condition and then create an effective, customized treatment plan to resolve the problem for you. Even better, many causes of heel pain are successfully treated with conservative (nonsurgical) care, and some can even be prevented from developing in the first place. Your hindfoot is made up of the calcaneus (heel bone) and talus (ankle bone), which sits on top of it. The calcaneus is the biggest bone in your foot, and it serves as an anchor for a couple of important connective tissues – the plantar fascia and Achilles tendon. These tissues play a certain role in some of the most likely sources of pain in the back of your foot (plantar fasciitis, Achilles tendinitis). 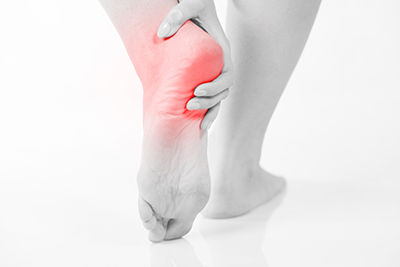 Plantar Fasciitis – When listing causes of heel pain, we start with plantar fasciitis for the simple reason it is, by far, the most common cause of heel pain for adults. The problem arises in a connective tissue known at the plantar fascia, which runs along the underside of your foot, helps support the arch, and connects the heel to the forefoot area. This particular fascia is generally quite strong, but excessive strain can lead to tiny tears and inflammation. The body works to repair those tears during times of rest and the initial steps afterwards can reopen them, which explains why the pain is most severe in the morning (after the body has spent all night mending the tears). Achilles Tendinitis – After plantar fasciitis, Achilles tendinitis is the second-most common source of heel pain for adults. Much like with the previous condition, this one is caused by an inflamed connective tissue. In this case, it is the Achilles tendon. Your Achilles is actually the largest and strongest out of the thousands of tendons in your body, but it is not infallible. Sever’s Disease – When a child or adolescent is experiencing heel pain, the likely culprit is a condition known as Sever's disease (or calcaneal apophysis). Now, the name is a bit misleading, since this is not actually a disease. Sever’s is a literal “growing pain” that occurs when a growth plate found in the back of the heel bone reaches physical maturity before the Achilles tendon. This creates a situation wherein the Achilles tendon—which isn’t as long at this point as it will eventually become—tugs on the insertion point in the back of the heel and causes pain for your son or daughter. The pain is typically strongest following physical activity. Retrocalcaneal (back of the heel) Bursitis – Whereas you know what a bone and muscle is, a less-known anatomical feature is a bursa. Bursae (pluralized) are fluid-filled sacs that provide extra cushioning for the muscles, bones, and tendons near joints. When these tissues become inflamed, it can cause pain in the back of the heel. Heel Spurs – As with bursae, not too many people are familiar with bone spurs. These spurs are calcium deposits the body builds up on normal bone tissue over time. They are often found in areas facing excessive pressure or force on a frequent basis, such as the bottom of the heel. Heel spurs sometimes develop when plantar fasciitis has been a longstanding issue for a patient. The specific course of treatment we pursue depends on the actual injury that was sustained. In many cases, nonsurgical care will help to reduce symptoms and allow the condition to improve. Conservative therapy can include ice, medication, rest, exercises, steroid injections, or custom orthotics. It is always our goal to exhaust nonsurgical procedures as we attempt to improve the situation. When conservative treatment doesn’t produce the results you hope to see, we may need to discuss surgery as the possible solution to your problem. Fortunately, this tends to be quite rare. Examples of possible surgeries for heel pain includes releasing a tight connective tissue or removing excess calcium buildup (a bone spur). No matter which course of treatment we recommend, Dr. Reister will discuss it with you so you can fully understand your options. Easing into physical activity. When starting a new running or exercise program, give your body time to adjust to the increased forces you’re placing on it. To keep your feet and ankles safe, start any new workout program at an easy level and then slowly ramp up your intensity and duration over time. A good target is a roughly 10% increase per week. Doing more increases your injury risk. Wearing proper footwear. Make sure you have the right shoes when exercising or participating in any sports. Additionally, choose footwear that has solid construction, fits correctly, and provides robust arch support and ample cushioning in the heel. Warming up and stretching. Before participating in any individual workout session or athletic activity, spend approximately 5-10 minutes walking at a brisk pace or light jogging, followed by dynamic stretches targeting the muscles you are going to use. Cross-training. Instead of running six days a week or relying on high-impact sports like tennis or basketball for your fitness, mix in a couple of sessions of swimming, cycling, walking, or yoga to reduce the total amount of physical stress placed on your feet and heels. No matter which of the common causes of heel pain is responsible for your pain and discomfort, we are ready to treat it for you! Come see us here at Richardson Podiatry Center and find the relief you need. Call us at (972) 690-5374 to reach our Richardson, TX office. Our staff will be happy to provide additional information or help you schedule an appointment with us!